A funeral marks the close of the earthly chapter of a human life. It is the opportunity for friends and family to express their grief, to give thanks for the life which has now completed its journey in this world and to commend the person into God’s keeping. Our ministerial team are happy to take funerals in St Peter’s or at South Tyneside Crematorium chapel, followed by burial or cremation; to bury ashes at a later date; to receive people into church overnight or to hold funerals in the context of a requiem mass – a service of communion. 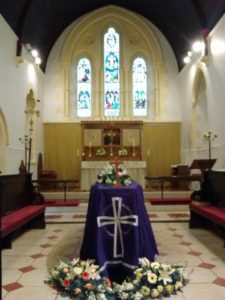 There is NO requirement to be a regular churchgoer – the Church of England will provide a funeral service for any parishioner, just ask your funeral director to contact us. Grieving is a natural and important part of coming to terms with and healing this loss, and it may continue for several months. One often finds it is those who have suffered a close bereavement themselves, clergy or lay people, who can most easily offer comfort and support to those who mourn. We will try to keep in touch with next of kin, and provide ongoing support where we can. We will also invite recently bereaved partners to our monthly afternoon tea sessions, to help alleviate some of the loneliness and meet with other people in similar situations.